I’ve been stuck in a funk of late. Sadly, not a George Clinton-flavoured funk, but a stank, stuck funk of my own making. My compulsive need to trace the original sources for all the revised riffs, beats, and samples that crop up in later Omar Rodriguez-Lopez projects has proved a lot more difficult than I thought it would be, and I thought it would be fairly difficult. And yet, I deluded myself into thinking it would all fall into place. It is, but at a frustratingly glacial pace, and I’m growing resigned to the fact that my attempt to construct an orderly timeline is a fool’s errand. This is the album that made me want to track this path in the first place. 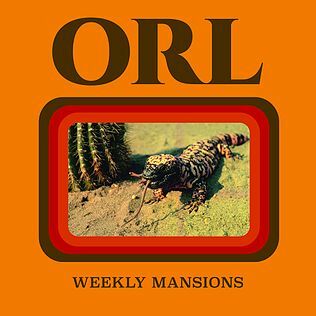 Released in late 2016 on the Ipecac Recordings label as part of Omar’s 24-album back catalog catch-up, Weekly Mansions feels both soothingly familiar and brand-new. Many of the albums in this series can (sort of) be easily identified as a complete album remixed and reimagined; this feels like a bridge linking the more guitar-driven and distortion-fuzzed earlier releases via a silky thread of instrumental segues and sound manipulation. If this were an aural equivalent to a magic eye poster, I’d gaze into it crosseyed, hoping for an optical illusion of The Mars Volta to appear. Dubbed “an eclectic exploration of neo-electro-dance”, it’s a totally guitar-free collaboration between Omar and his brother Marcel (aka Eureka The Butcher), which positively heaves with bleepy joy. I would fervently press it into the hands of all my friends, were a physical edition available. Such is my deep and abiding love for it that I rate it as highly as I do Old Money, and I do not say that lightly.